Los Alamitos Race Course continued morning works on Saturday for 2-year-olds. 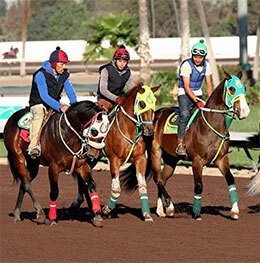 LOS ALAMITOS, CA—APRIL 14, 2019—There's a lot to like when it comes to the 2-year-old fillies Fuego De Pithia and Carolina Corona, the owners of the morning's best :12.3 drills on Saturday at Los Alamitos Race Course. Trained by Juan Aleman, Fuego De Pithia was quick into her stride and fired nicely despite drifting inward while brushing her inside rival. The Tres Seis filly will certainly improve her technique and the quickness is there to enjoy a successful season. The Oklahoma-bred filly is also out of rising star Pithia, a three-time winner and earned of $39,212 in her career. The winner of the Minnesota Derby and Minnesota Breeders Derby in 2011, Pithia is the dam of Eos A Political Win, who scored victories in the Grade 3 Dash For Cash Derby and Retama Park Derby in 2018. The colt by Apollitical Jess has won six stakes trials races in his career while earning $309,520. From the barn of Jaime Gomez, Carolina Corona is an exciting prospect. The filly broke nicely while working in between horses, but it's her ability to accelerate into her stride that makes her one to remember. Dark Knight (:12.5) California-bred gelding by Favorite Cartel out of the multiple Los Alamitos winner Nimble. The mare is from the great family of Oh La Proud, who has produced AQHA champions Hawkinson, Hawkish and Flame N Flash. Nimble won two allowance races at Los Alamitos and $28,130. She's the dam of multiple winner Be Quick. El Tiznado (:12.5) Separatist colt out of Getchacartel, a lightly raced mare of three starts. Getchacartel's mother is Ill Getcha Good, a winner of $60,086. Their bloodlines go back to the great Dashing Phoebe ($609,553), winner of the Grade 1 Kansas Futurity in 1985 and Kansas Derby in 1986. Favorite Illusion (:12.5) California-bred colt by Favorite Cartel and out of Sweetest Illusion, who earned $29,019 in her career. She won her trial to the PCQHRA Breeders Derby and qualified to the La Primera Del Año Derby during her racing career. Juvenila Cantina (:12.5) Foose filly is out of Little Talks ($568,897), who won stakes races at Los Alamitos in 2015, '16 and '17. She captured the Golden State Million Futurity in '15 and followed it by winning the PCQHRA Breeders Derby during the following year. Her final career start as a 4-year-old was a victory in the Denim N Diamonds Handicap. Juvenile Cantina is her first foal. Ynot Pout (:12.5) worked evenly with Juvenile Cantina. Filly is by Favorite Cartel and out of Ynot Bar, who finished in the top three in six of her seven lifetime outings. Ynot Bar ran second in the 2005 Governor's Cup Futurity and qualified to the Los Alamitos Two Million Futurity. She's the dam of Grade 1 Los Alamitos Winter Derby winner Ynot Walk and Larryville ($28,000). Aquachick (:12.6) Utah-bred Corona Cartel filly from the family of Runaway Wave, who is the dam of World Champion Wave Carver and champion Ocean Runaway. Her dam, Aquafina, is a full sister to both Wave Carver and Ocean Runaway. She won four races and $188,336 in her career, including the Adequan California Derby in 2011. She finished third in the 2010 Golden State Futurity here. Aquafina is also the mother of Corona Springs ($93,963), the winner of the AQHA Canterbury Distaff Challenge last year. Jocko Mo Blue (:12.6) California-bred colt by Walk Thru Fire and out of Amore La Blue, whose racing career features three wins and $159,339 in earnings. She finished third in the Grade 1 Golden State Million Futurity in 2012 and was fifth in the Golden State Derby the following year. Like Her Six (:12.6) daughter of Stel Corona and out of Dont Pass Bar, she's a full-sister to AQHA champion aged mare Quirky ($424,098). Her granddam is the graded stakes placed mare Ynot Bar ($136,480). Pay Me In Front (:12.6) colt by First Down Dash is the first foal out of the multiple stakes winning mare Bac In Front ($226,956), the winner of the 2015 La Primera Del Año Derby and PCQHRA Breeders Derby. Bac In Front won eight races in her career and was part of seven stakes events. Videos of all gate works at Los Alamitos are available at losalamitos.com.